Strong southerly winds will continue today ahead of a cold front arriving later tonight. Severe thunderstorms will be possible in advance of the cold front this afternoon through this evening and overnight. Threats of large hail, damaging winds, tornadoes, and locally heavy rainfall are all possible during this event. Severe potential will shift to more of a damaging wind threat as storms evolve into a squall line tonight ahead of the cold front. The severe threat should be ending before daybreak on Saturday. Total event rainfall amounts up to three to four inches will be possible across parts of North Central Louisiana and South Central Arkansas, increasing the threat of isolated flash flooding across these areas. Thunderstorms will be gradually ending from west to east with cold frontal passage early Saturday morning, bringing an end to the severe threat. 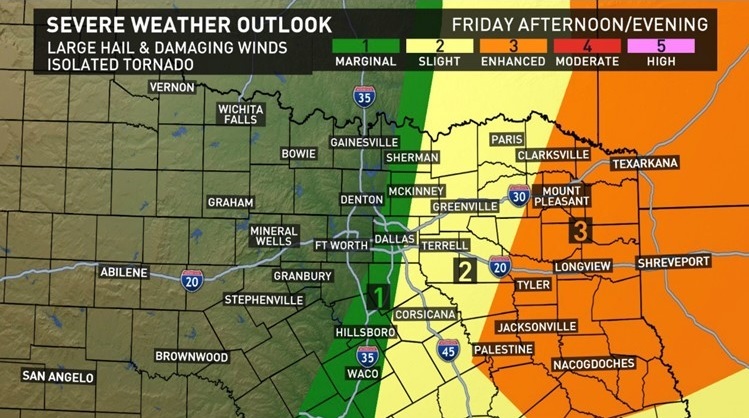 Friday afternoon through Friday night will require the activation of emergency management personnel, amateur radio operators, and storm spotters.